Well, what can I say? We made it to the World Series but just didn't win. To be honest, the Red Sox were the better team. They out-hit and out-scored us and that is that. Yes, I was very upset during the actual games when there were silly, silly mistakes or when we just could not get a hit or when everyone Cardinal fan knew they should be walking David Ortiz and we didn't . . .but, when put into perspective, we made it to the World Series and I can't really complain. We just won the Series in 2006 and then in 2011, how can I complain? Even though we didn't win, some things never change about my love affair with the St. Louis Cardinals. This is NLCS Game 6 on November 18. Stupid St. Louis Weather! I also always love when they bring out the pride of St. Louis, the Budweiser Clydesdales. It NEVER gets old! I also love being able to experience the post season with family and friends. In the end, I am proud of the Cardinals. It stinks that we didn't win but our future is bright. We are a young team with lots of post seasons in our future. As many of us discussed during the playoffs, we are very spoiled in St. Louis. It is almost just assumed that we WILL make it to the post season. We I often forget that it isn't an automatic thing. 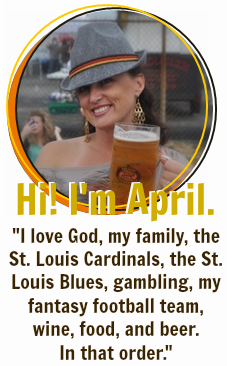 This pretty much sums it up for me (Click HERE for a video from the Cardinals) and I am already counting down the days until March 31, Opening Day! I am a Sox fan so I am happy your Cards didn't win! But we in Boston were feeling the same with no hitting and silly errors! Both great teams I think! Ha! I think if we would have won Game 6 then we probably would have won the whole thing; however, our bats just did nothing. Our 5, 6, and 7 batters were 10 for 69 with no RBIs!! You can't win a game like that. That series sure was something, though, crazy endings!!! Awesome recap and season!! Love all of the pictures :) Ya'll are too cute!